A joyous interior with an assortment of lovely candy colours was created with family in mind. 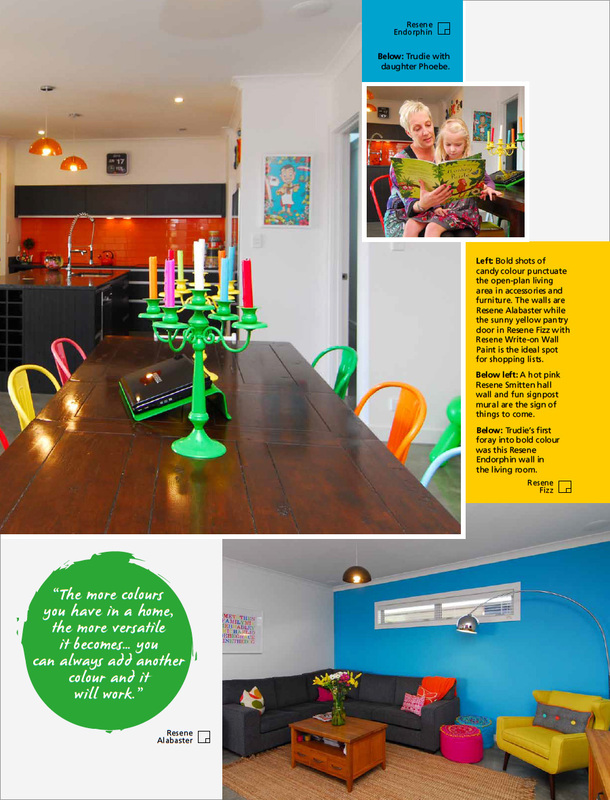 A joyous jumble of sunny colour welcomes visitors to the Nettle house on the outskirts of Havelock North. 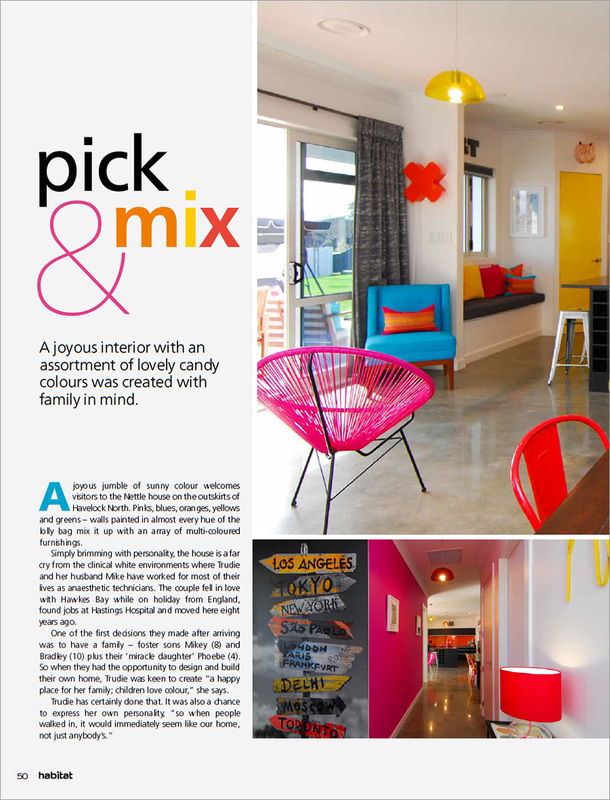 Pinks, blues, oranges, yellows and greens – walls painted in almost every hue of the lolly bag mix it up with an array of multi-coloured furnishings. Simply brimming with personality, the house is a far cry from the clinical white environments where Trudie and her husband Mike have worked for most of their lives as anaesthetic technicians. The couple fell in love with Hawkes Bay while on holiday from England, found jobs at Hastings Hospital and moved here eight years ago. Her dramatic colour and design choices certainly wow guests as they step through the front door. A signpost artwork points to capitals of the world. A yellow Havelock North sign by Ian Blackwell makes a handy place to stash car keys. And straight ahead, a lively shot of orange tiled splashback is visible above the kitchen bench, behind a dining table surrounded by multi-coloured metal chairs. 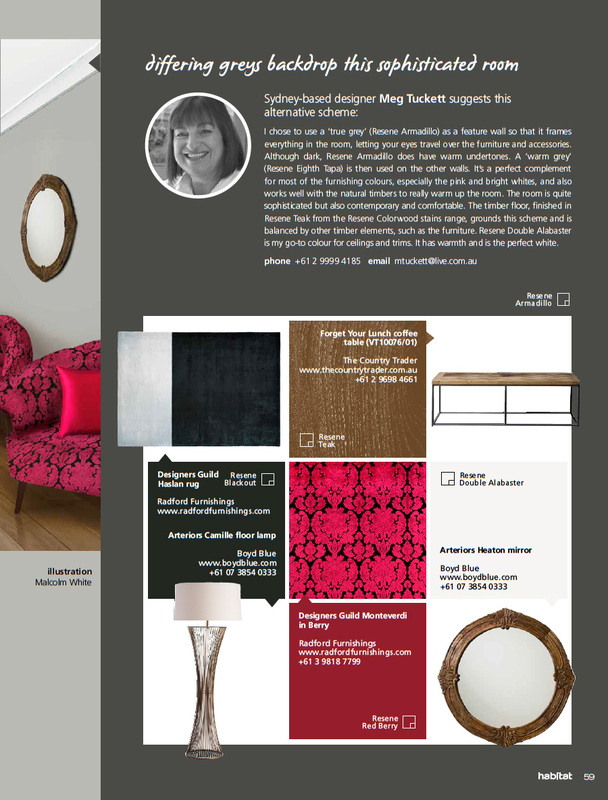 Yes, Trudie loves colour but the interiors didn’t start out that way. When the family first moved in, all of the walls and trims were in white Resene Alabaster. Once all the furniture was in place, the home became more lively, but as Trudie says, “something was clearly missing”. So, she got busy with the paint pots. First, Trudie painted a wall in the living room to match the sky blue armchair and ottoman, using Resene Endorphin. After a month of getting used to the colour, she painted the wall opposite in hot pink Resene Smitten. It echoes a grandfather clock wall sticker standing tall on another living room wall. Trudie was smitten from the start. Mike wasn’t so sure. Now, he concedes that the pink is growing on him – as are many other vibrant hues that have since joined the collection. Once Trudie started, there was no limit to her colour adventures. The more she experimented, the more her confidence grew. “The more colours you have in a home, the more versatile it becomes. I found, you can always add another colour and it will work. If you stick to one colour, you’re limiting yourself. There are so many colours around here that if you picked another one, it would just fit. 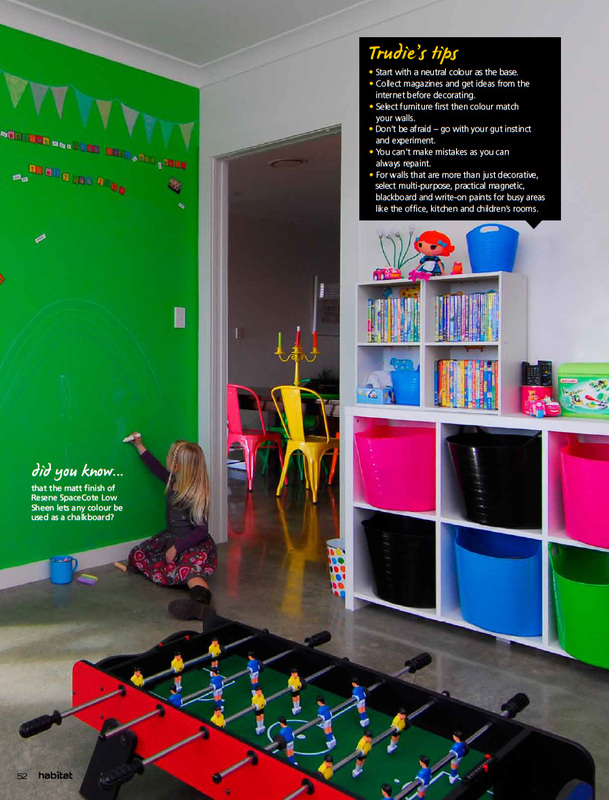 Colour is not just a decorative way to enliven the home but a practical device for work and play with Resene Magnetic Magic in the playroom, Resene Blackboard Paint in the office and Resene Fizz with Resene Write-on Wall Paint in the kitchen. Some of Trudie’s colour choices are cleverly planned for family harmony. By giving each child ownership of a specific colour, she found a way to circumvent squabbles. That colour is carried right through from dinner plates to dining room chairs to bedrooms. Daughter Phoebe’s colour is pink with bedroom walls in Resene Princess, Mikey’s colour is green with a door in Resene Wasabi, a camouflage-style wallpaper and Resene Anemone Green walls. 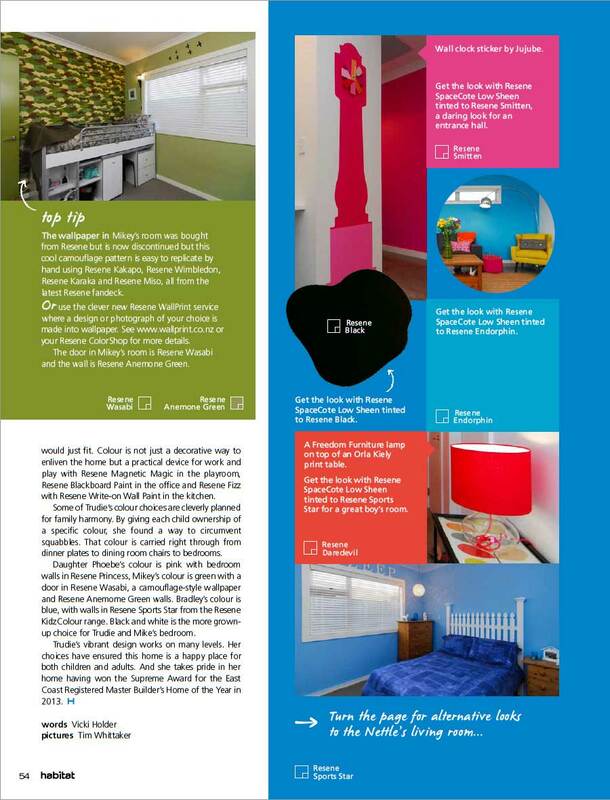 Bradley’s colour is blue, with walls in Resene Sports Star from the Resene KidzColour range. 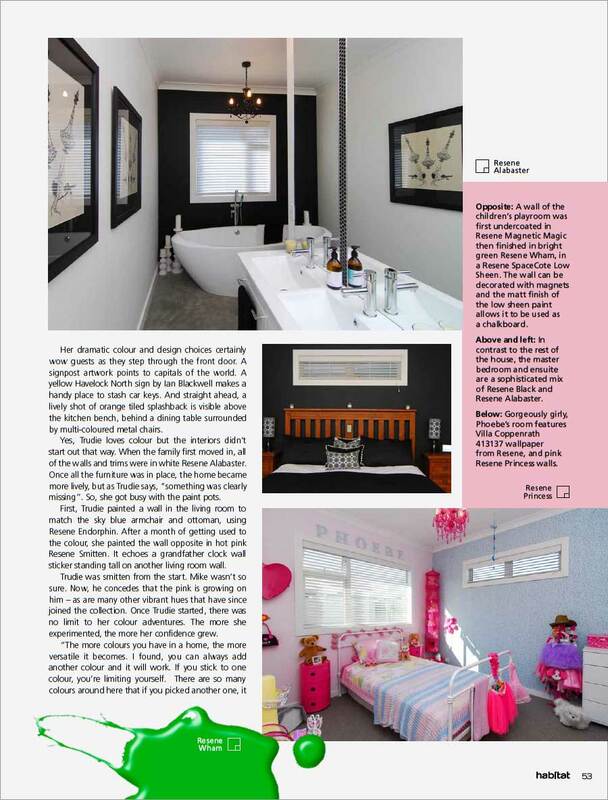 Black and white is the more grownup choice for Trudie and Mike’s bedroom. Trudie’s vibrant design works on many levels. Her choices have ensured this home is a happy place for both children and adults. And she takes pride in her home having won the Supreme Award for the East Coast Registered Master Builder’s Home of the Year in 2013. Start with a neutral colour as the base. Collect magazines and get ideas from the internet before decorating. Select furniture first then colour match your walls. Don’t be afraid – go with your gut instinct and experiment. You can’t make mistakes as you can always repaint. For walls that are more than just decorative, select multi-purpose, practical magnetic, blackboard and write-on paints for busy areas like the office, kitchen and children’s rooms. These owners clearly love colour. In the existing room, my eye was drawn to the highlight window. I used colour blocking to create pattern and remove the window from being the feature of the room. The colours chosen were from the new Resene The Range fashion colours 16 fandeck. What is a fashion colour? You only need to look toward your latest clothing purchases. It’s fun to play with colour in an area like this. It can be easily repainted when the moment passes or your tastes change. These colours only pop when balanced by the right white. I chose Resene Double Alabaster for its warmth. It’s best to have neutral well-designed furniture that will last, and then experiment with paint colours. The over-scale pendant light over the coffee table creates a focal point, centered to the room, to add scale and balance. 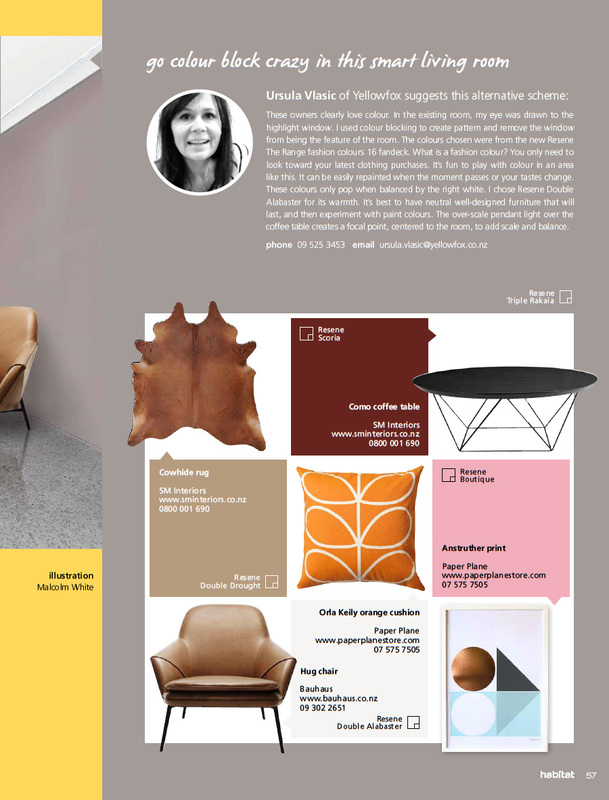 I chose to use a ‘true grey’ (Resene Armadillo) as a feature wall so that it frames everything in the room, letting your eyes travel over the furniture and accessories. Although dark, Resene Armadillo does have warm undertones. A ‘warm grey’ (Resene Eighth Tapa) is then used on the other walls. It’s a perfect complement for most of the furnishing colours, especially the pink and bright whites, and also works well with the natural timbers to really warm up the room. The room is quite sophisticated but also contemporary and comfortable. The timber floor, finished in Resene Teak from the Resene Colorwood stains range, grounds this scheme and is balanced by other timber elements, such as the furniture. Resene Double Alabaster is my go-to colour for ceilings and trims. It has warmth and is the perfect white. that the matt finish of Resene SpaceCote Low Sheen lets any colour be used as a chalkboard? The wallpaper in Mikey’s room was bought from Resene but is now discontinued but this cool camouflage pattern is easy to replicate by hand using Resene Kakapo, Resene Wimbledon, Resene Karaka and Resene Miso, all from the latest Resene fandeck. Or use the clever new Resene WallPrint service where a design or photograph of your choice is made into wallpaper. 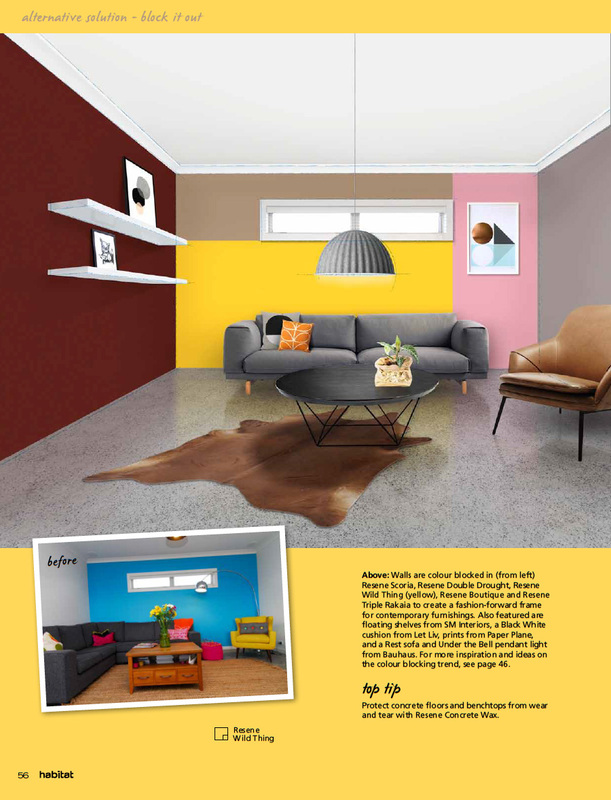 See Resene Wallprint or your Resene ColorShop for more details. The door in Mikey’s room is Resene Wasabi and the wall is Resene Anemone Green.